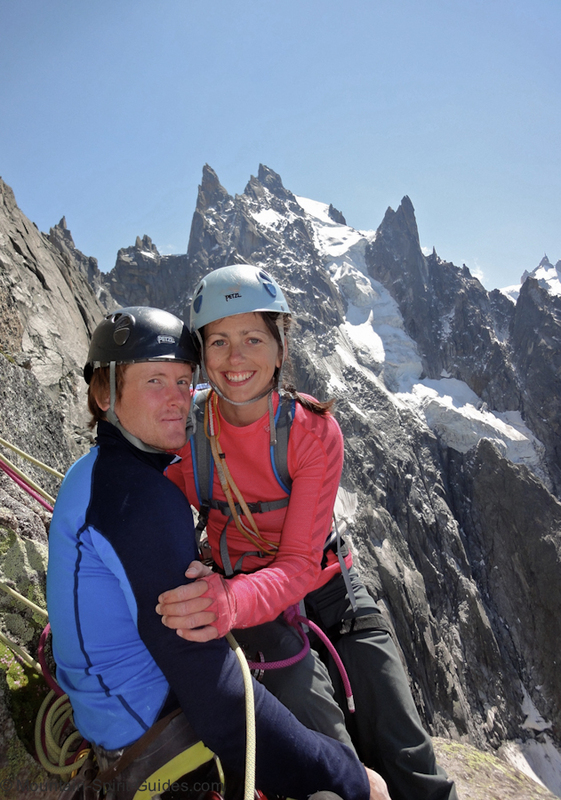 Aig de Blatiere is clearly visible from Chamonix town, and when its steep west face is bathing in the afternoon sun it is easy to feel strong and ready for a battle with the grey pillar. 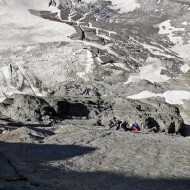 Early the next morning, at the base of the west face at around 3000m altitude, it is as always freezing, and the first corner crack is like a cold shower for breakfast. 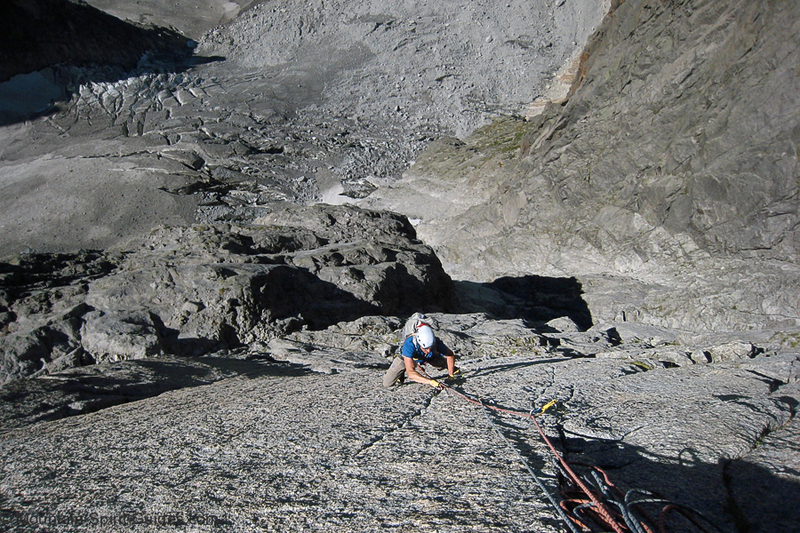 Waking up is hard in the brut reality of the unforgiving grey granite that constitute the first half of Fidel Fiasco. 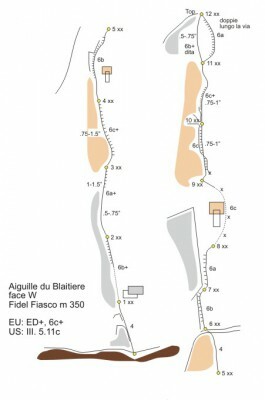 Fidel Fiasco on Aig. 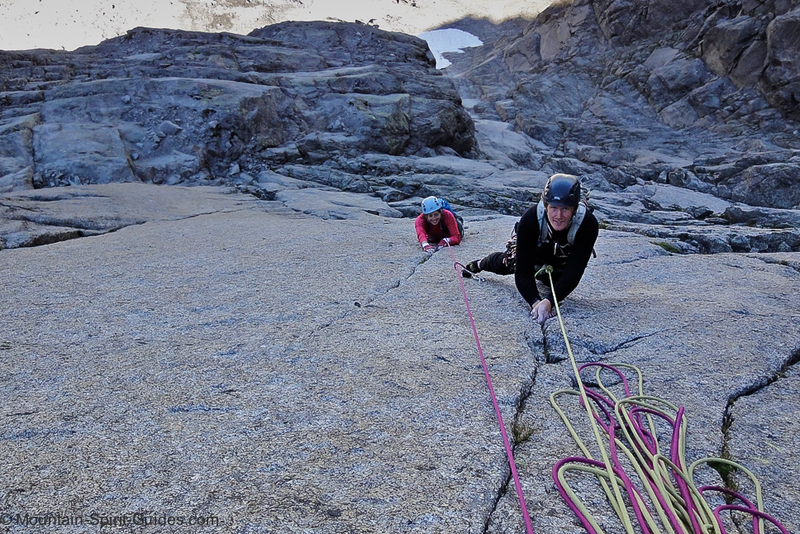 de Blatière; a 350m long route on slabs and thin cracks, graded ED overall, considered a classic test piece for advanced alpine rock climbing in Chamonix. 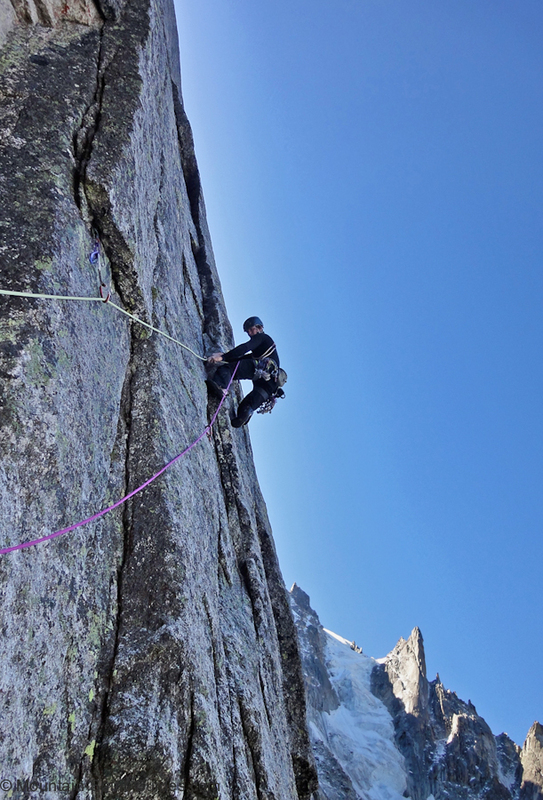 It has retained its style of pure trad climbing and is bolted (sparsely) only on the completely crack free slabs, truly 6b obligatory! 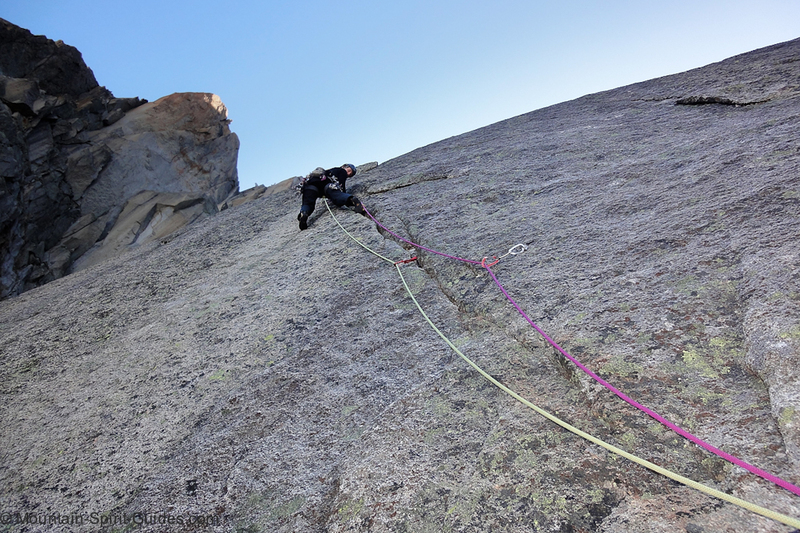 The upper part of the route follows jamming cracks on red and yellow granite (apart from one challenging slab pitch). 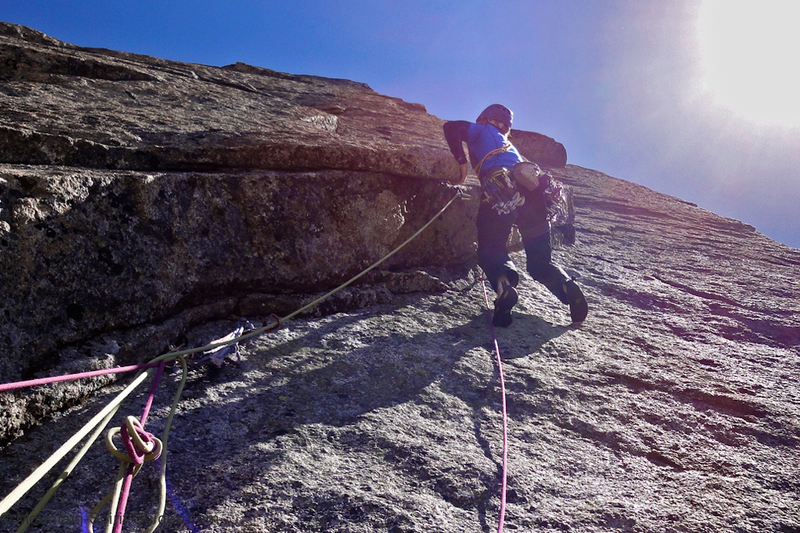 Reaching the “yellow tower” normally concur with the sun hitting the face, which reinforces the contrast from grey to red, cold to warm, and it is a pleasant change. 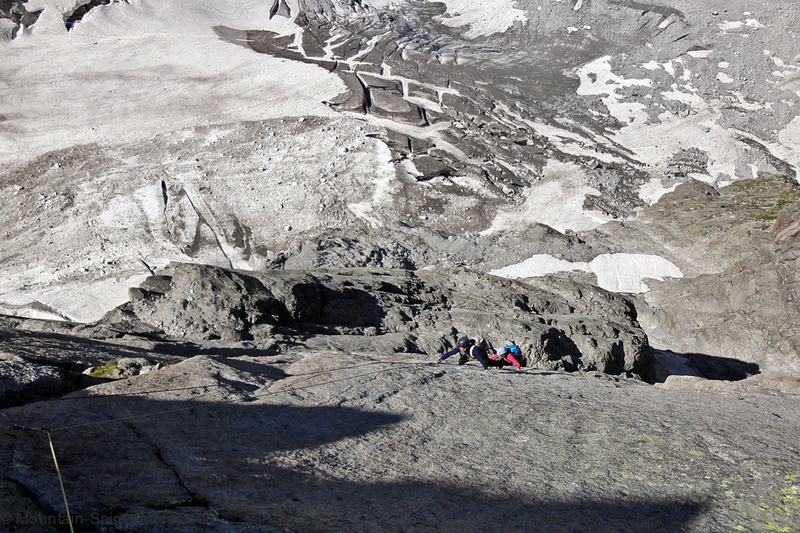 Even so the climbing certainly doesn’t allow for any relaxing, it is full-on till the end! 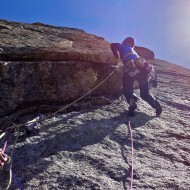 You find almost no old slings or left-behind gear. 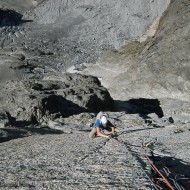 All belays have two bolts and the rappels are clean and trouble free. So the over all impression is a beautifully clean and direct line on a smooth face. 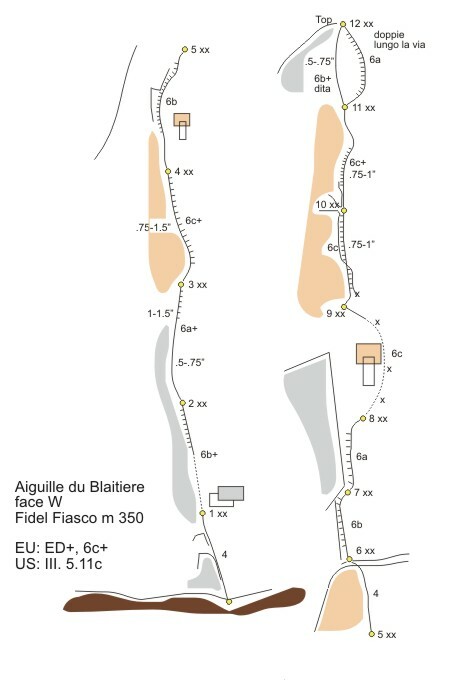 Recently I found an alternative topo of Fidel Fiasco at camurrilamberto.it offering a more modern opinion on the grading (topo on the left). 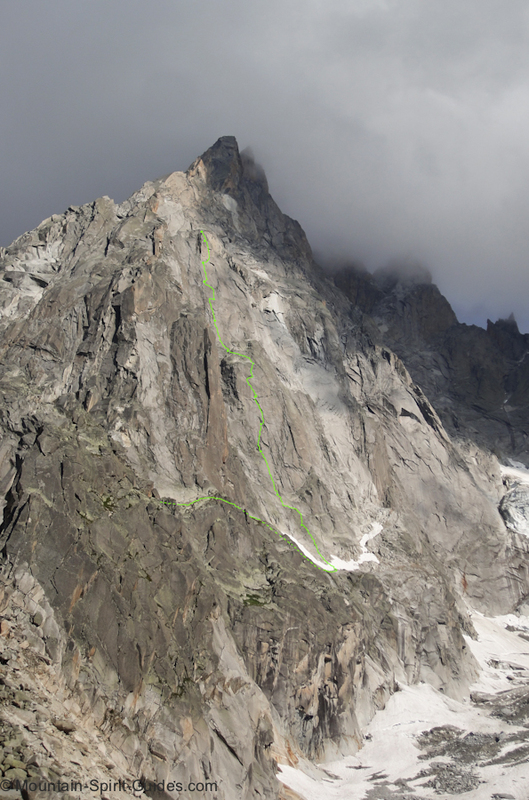 It is part of a new guide book coming 2012: Mont Blanc Supercrack by Lamberto Camurri, Giovanni Bassanini. 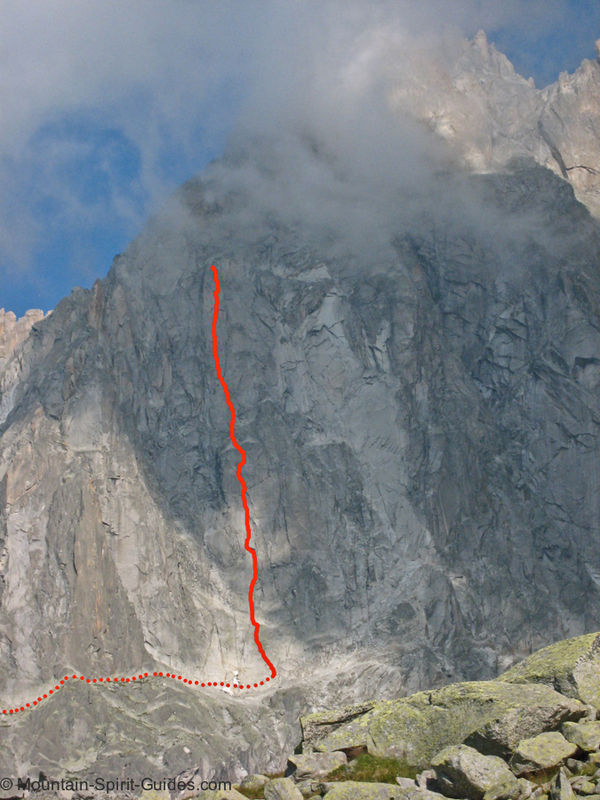 Being a truly magnificent route, we have been back to climb it both in 2010 and 2012. 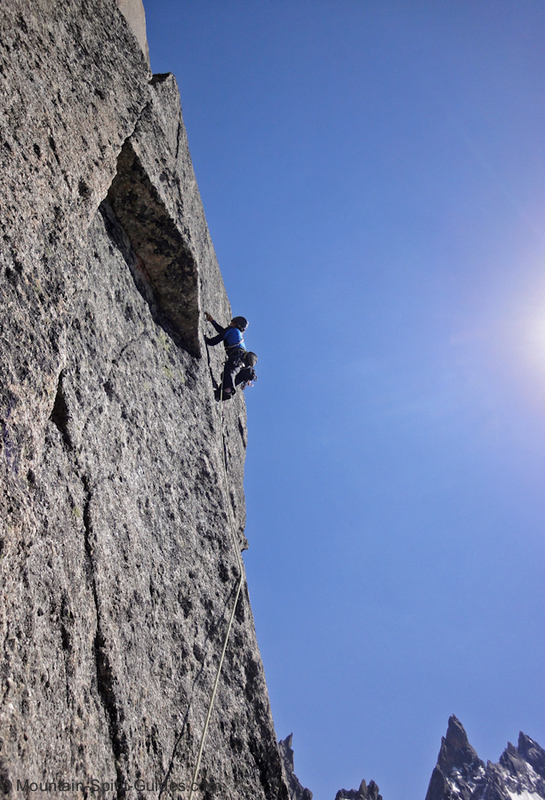 One key factor to get to see every pitch from it’s best side is to do this climb on a warm summer day. 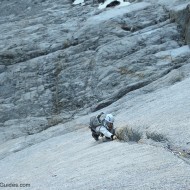 We finally got the warm and dry conditions you want on our climb in July 2012. 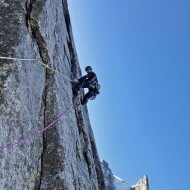 This time the rubber on our shoes wasn’t solid frozen and our finger could feel the granite also on the first 5 pitches. 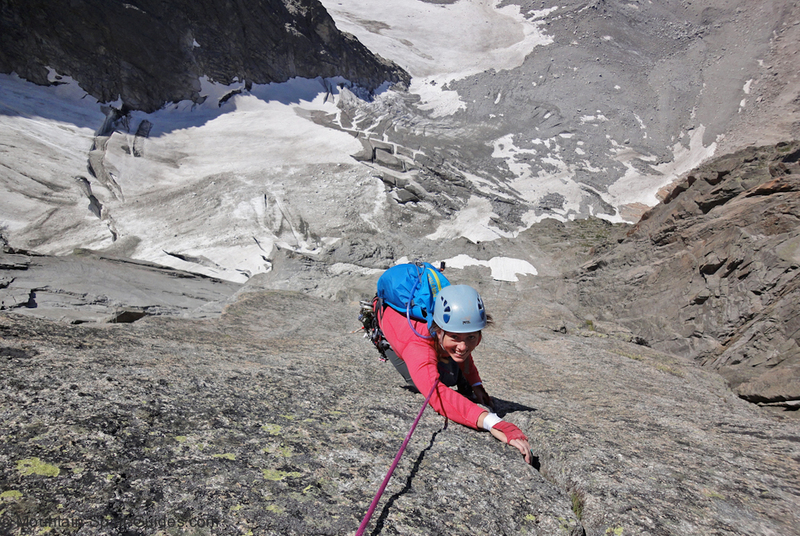 These sticky conditions considerably speeded up the climb, boosted up our confidence, and made the whole climb enjoyable! 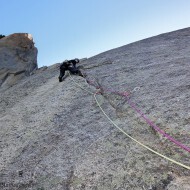 If the slab on pitch 9 gets the sewing machine going you can tension traverse out to the right from the 3rd bolt on the pitch and climb a dihedral before getting back onto the slab by the last bolt. 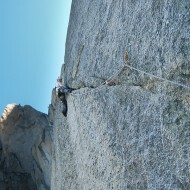 However, if you are a competent slab climber you should of course stick to the line, which is beautiful. 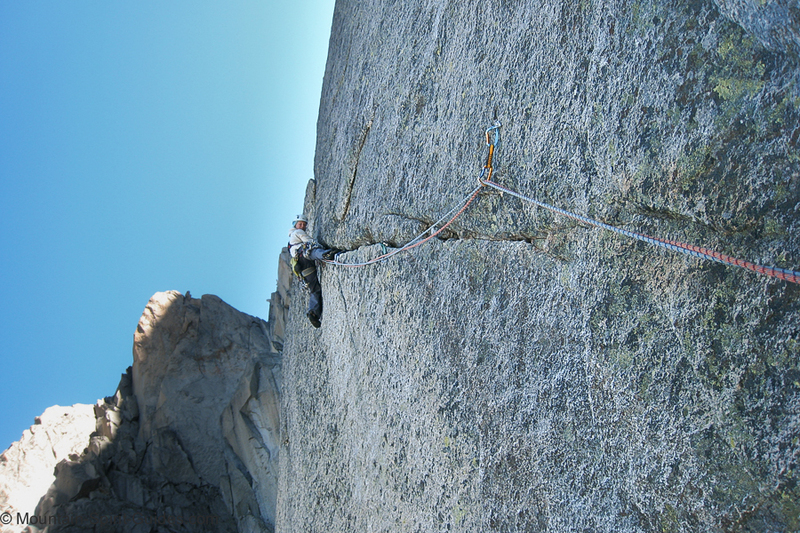 The belay before pitch 11 is a hanging one and the angle of the face steepens up for the last time. You need to put some effort in here. 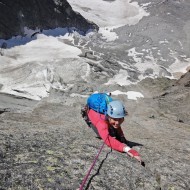 The last short pitch (pitch 12) follows the continuation of the crack you came up on the previous pitch, through a small roof. 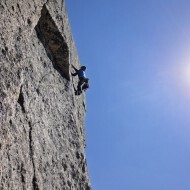 I’m not sure which one of the 2 variations in the Italian topo that is, but it’s a nice finger crack. 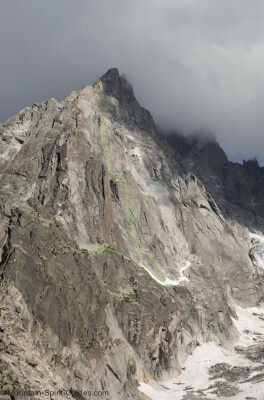 The line from a different angle (photo on the right). 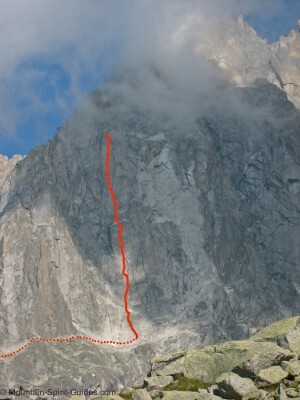 All belays are marked with a little dot, click on the photo to enlarge. 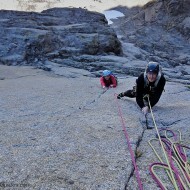 2 * 50m ropes, small nuts, and a double set of cams from tiny up to camalot no 2. 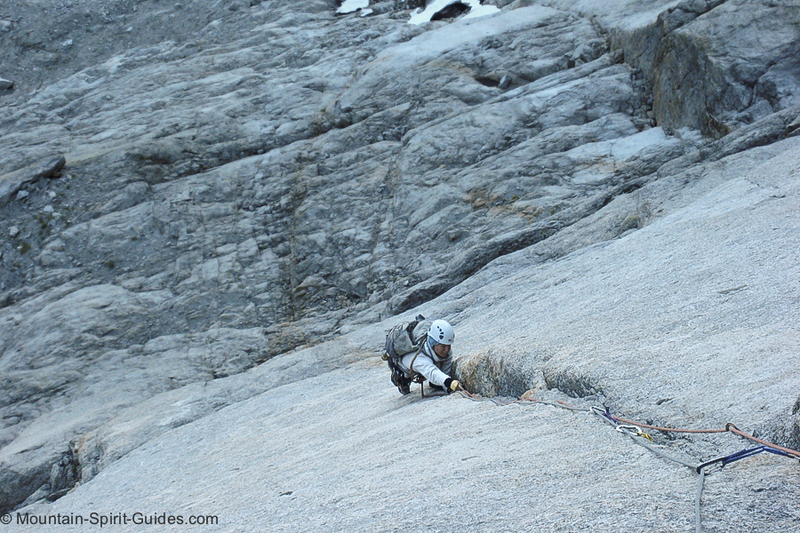 Categories: Alpine Rock Climbs, Rock Climbing and Route Descriptions. 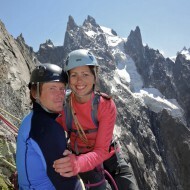 Tags: Blatiere, Chamonix, Fidel Fiasco and topo.